It was garish, had horrific sound, and played a bit like a mule. However, there was an idea in there… a nice little variant on the usual Gems formula popularised by Bejeweled and co. This time, we’ve got a leaderboard and some achievements added to the mix, as well as general clean-ups throughout. We’ve only just released it as of yesterday, but it has been a chaotic journey to get here, and proof that if anything, Ludum Dare – and by extension One Game A Month – are incredibly useful for iterating over ideas! Our two person team, Surprised Man loves Ludum Dare because it’s the thing that actually got us making games instead of just talking about it. Since doing The Wager at the end of last year for LD19, we’ve been tinkering with it and working on our next projects. But we’re hoping to take a break from our current project this December to have another go for LD22, as long as any unforseen busy-ness doesn’t prevent us as can happen this time of year. So make that a tentative we’re in! As for The Wager, we’ve had thousands of people play it which beats our initial estimate of ‘maybe twelve,’ and we got such cool feedback that we’ve been dipping in and out of it for the last few months and have finally released 1.2 (an improved version of 1.1, which itself was an improved version of the Ludam Dare Jam submission). It’s a Windows game, in case you’re wondering. Thanks for the LD people for making it happen. Improved feedback on the second puzzle and refined some other things. Last and probably final update to my Hieroglyph-deciphering game. Replaced handwriting with a font, tweaked puzzles, added some sound and various other changes. More info in the TIGS forum thread. Fixed some bugs, improved usability. 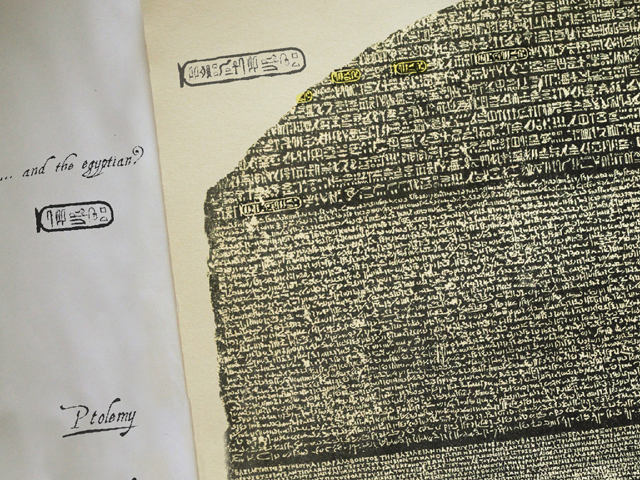 New version of Hieroglyph deciphering experiment Rosetta. Revised some of the puzzles and made various other adjustments. Thoughts/comments welcome. I’ve done some more work on my Hieroglyph deciphering experiment. Added a new page between one and two where you take a look at the actual stone and go through some more steps before arriving at the obelisk puzzle. Plus various tweaks, both visual and functional. We’ve had an amazing 2 weeks. What a great couple of weeks it has been! After our complete and utter failure to implement our LD20 Jam game how we wanted to, everything else has just massively made up for it. First, our LD19 Jam game, The Wager which we released an updated version of just before LD20 got noticed and ‘Freeware Game Pick’ed by IndieGames.com, then we caught praise from Rock Paper Shotgun and Destructoid. Just this week a lovely, long bit on the start of the Gamers With Jobs podcast is the latest thing. At time of writing, an estimated 2000 people have played our game. That’s hardly setting the world on fire but considering that we were delighted when the count stood at 200, seeing that ten times over is… well, we’ve been grinning a lot. And this, our second game ever. Over all comments have been very positive from nearly everyone, with some good criticism mixed in which is really helping with the update we’re looking to release as soon as we can. Then it’s onto the next project, in which we hope to resurrect our LD20 attempt in a very-much-changed form. Most importantly, we may never have gotten around to actually making games instead of talking about it if it hadn’t been for the LD Jam, so I wanted to thank everyone that helped get that portion of the event going. I also want to put in a good word for the Jam, because I still think it tends to get lost behind the bluster of the main competition and I’d love to have the organisers think of some ways to give it a bit more love. 24 queries executed in 0.174 seconds.